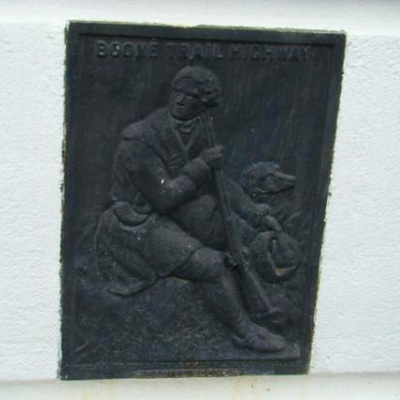 This Boone Trail Highway marker shows an image in relief of Daniel Boone and his hunting dog from an 1861 illustration by Alonzo Chapel. 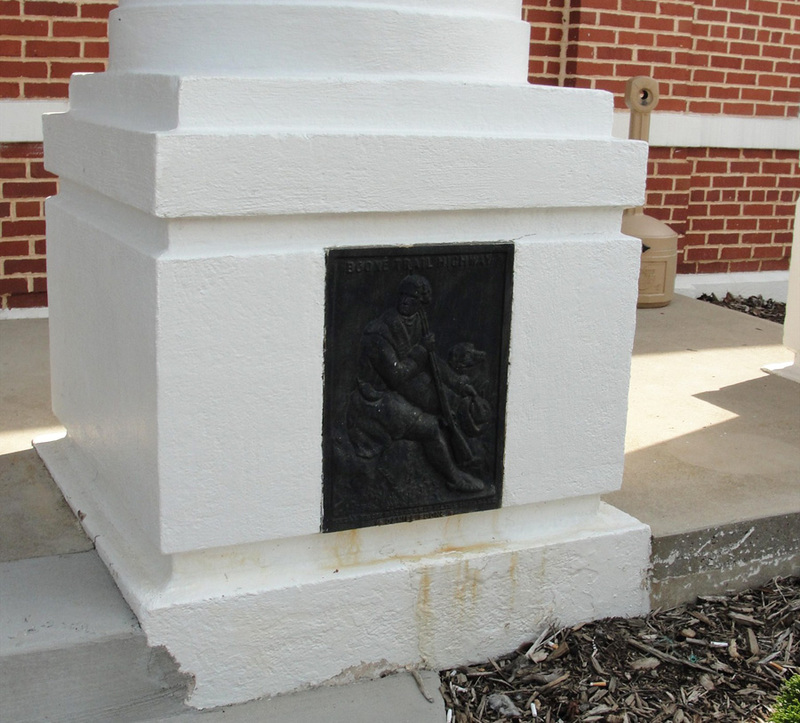 It is attached to the base of a column leading into the Alleghany County Courthouse. The steel tablet is a Style-2 which was seen as early as 1919, used through 1926 and distinguished by the BOONE TRAIL HIGHWAY caption being in block letters. This Boone Highway marker was numbered 61 by Everett G. Marshall. His interest and research of the markers led to the book, Rich Man, Daniel Boone. The numbering system was simply the order in which he found or became aware of a marker. The tablet is located at the base of a column leading into the Alleghany Courthouse, Main Street (Rt. 21) in Sparta, NC. On the courthouse lawn is a memorial to Robert Lee Doughton and the Alleghany County Veterans Memorial. The memorial plaque is attached to the right column if facing the courthouse building, with evergreen bushes planted in front of the main entrance. This marker is probably not in the original location. It most likely was the one presented to the school children of Sparta in 1927 for placement in the high school.